With 1 – 2-bedroom units sized between 600 – 900 square feet, this apartment complex has a quaint park-like community in a great location. Ranging between 617 – 919 sq. feet, the grounds at this apartment complex are very open and give you room to breathe. This apartment complex offers 1 – 2-bedroom units that are between 500 – 965 square feet, and has great shopping, entertainment, and dining nearby. These luxury apartments range from 863 – 1,426 sq. feet in size and your deposit can be waived on approved credit. These apartments are super-nice. With 1 – 2-bedroom units sized between 731 – 1,042 square feet, this community is near the Fiesta Mall with all its excitement and shopping fun. 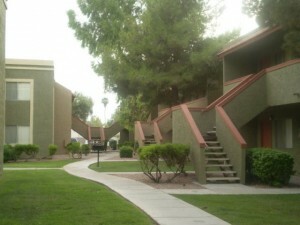 This complex offers 3-bedroom units in addition to the standard 1 – 2-bedrooms offered by many apartments. Sizes here range between 726 – 1,245 sq. feet. Notably friendly to past foreclosures, this apartment complex can help you get back on your feet with 1 – 2-bedroom units sized between 794 – 1,117 square feet. Also foreclosure-friendly, these apartments have units between 642 – 1,049 sq. feet. They also have convenient access to ASU and campus activities. With spacious floor plans ranging between 750 – 1,000 square feet, these apartments include a washer and dryer, walk-in closets, bookshelves, microwaves, and more. 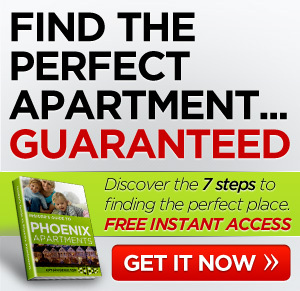 Now you have several options for renting apartments just outside of Phoenix that could really be a great fit, regardless of your needs. Print out this list and take it with you as you tour apartments so you can keep track of your notes. How about you? 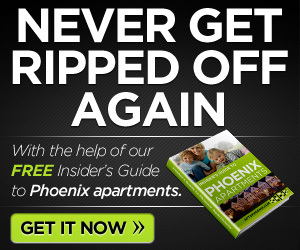 Any luck finding apartments near Phoenix? Comment below.